While investigating an apparent accident with his LMD companion Annie, "Thunderbolt" Ross once again encounters MODOK, one of the villains who made him the Red Hulk he is today. But he also encounters another face from the distant past, one which foreshadowed the obsession with ultimate power. I've got to hand it to regular series writer Jeff Parker: he's made me a believer in the Red Hulk during this last year. 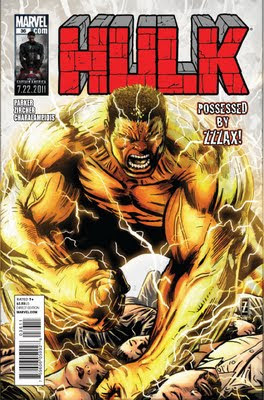 During "Fall of the Hulks" and "World War Hulks"--in fact ever since I concluded Ross to be the face of the Red Hulk--I often wondered whether any light would be shed on the character's previous flirtation with power on par with the Hulk's. Now, with this issue, the answer's arrived. Eagle-eyed Marvel fans will remember that in late 1986, when writer/artist Al Milgrom brought back the original, grey-skinned behemoth and turned Rick Jones into a new green Hulk, he also sent disgraced General Ross on one final mission to stop the Hulk. To do so, SHIELD helped him siphon the power of the Hulk's longtime foe, the electrical monstrosity known as Zzzax. The two beings joined as one with Ross in control, and together they nearly killed Rick Jones before realizing Banner wasn't the monster they were fighting, and before Ross realized what the depths of his own hatred for Banner had driven him to do. 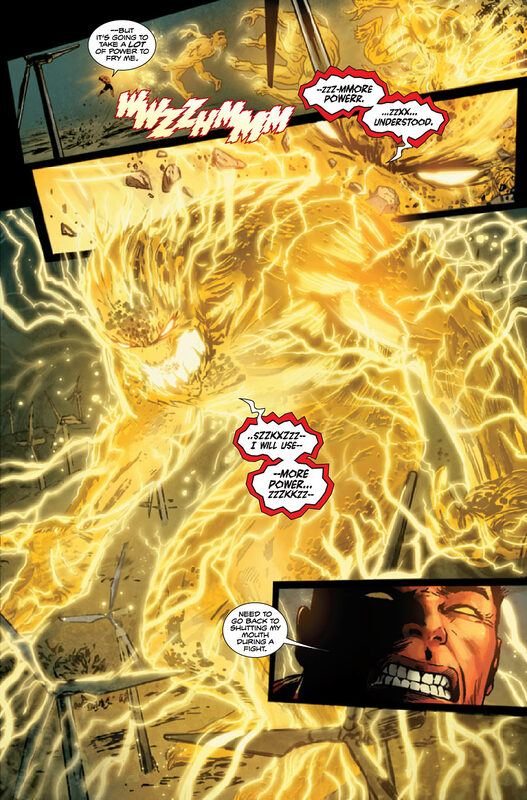 Zzzax and Ross separated, but Ross retained some of Zzzax's power, using it a short time later to save his daughter Betty--and Banner--from another threat, sacrificing himself in the process. Parker may not go into as much detail as I just did, but the point remains that Zzzax returns in this story, and the writer took full advantage of his previous relationship with our crimson protagonist. Although he plays fast and loose with history--Ross was never in uniform during the original storyline, and he paints the Zzzax operation as a military one instead of SHIELD backed, just so he could involve then-Major Fortean in a cameo--there's enough attention to the original storyline to satisfy me as a longtime reader and fan. The history bits also aren't too intrusive as to alienate anyone who might not have been reading Hulk comics over two decades ago (although one footnote wouldn't have killed anyone). Involving Zzzax's unique relationship with Ross in the story's denouement is also a truly clever bonus of which I wholeheartedly approve. The words on the pages aren't the sole recipient of my praise, as I have many more such accolades for one of my favorite, vastly underrated artists, the versatile Patrick Zircher (here called "Patch"). I've followed his work for a long time--since the days of his and Evan Skolnick's New Warriors--and he's always impressed with a look that is both modern and traditional. Here, his art is no exception. Seeing him cut loose on a Hulk story--with villains as big and bad as MODOK and Zzzax--was a dream come true. His Red Hulk is powerful, his Zzzax is even more powerful, and his MODOK is delightfully sinister. The artwork is full of Zircher's traditional flair even as he's adapted somewhat to the tone regular series artist Gabriel Hardman set. It's only enhanced by Jim Charalampidis, whose talent has developed well since his last efforts over Hardman in #30.1. So, what do we have in this story? A few terrific Hulk villains from the past with rich ties to the protagonist, and some ongoing moments of peculiar humanity between Red Hulk and LMD Annie. While I'll never enjoy the adventures of Thad Ross as much as those of Bruce Banner, the book is still in good hands and continues to impress on the same level it has since Parker took the reins. It's true the book has suffered when guest artists have come out to play (c.f. the last two issues), but this issue is a definite exception to the rule. Gary,this might be a long shot but do you think the continuity changes with the scene about Ross and Zzaxx and General Fortean might imply that Ross was behind a earlier battle between Zzaxx and the Hulk?